She's made her way up the industry rungs steadily, but Farah Khan has now officially gone from choreographer to Queen Bee. Samiullah Khan asked, Since u r a choreographer first, y dont u make a movie on dances? Farah Khan answers, yeah, the next movie I'll make. it's the most cliched thing to do. 20 years ago I was beaten to it by Disco Dancer. Samiullah Khan asked, Did u watch OSO? Tell me ur favourite scene of the movie. rashmila asked, hi Farah.....why don't you plan a movie without Shahrukh?there are other and more importantly BETTER ACTORS other than SRK, isn't it??? prachi asked, hi arun,how r u? nice to know that ur also a fan of shaid kapoor. would u work with him? Farah Khan answers, shahid is very nice and all, but yeah, I'd probably make him dance a little better. he is a good dancer but he always looks like he's dancing, I'd like to free him up a bit more. prachi asked, yes offcourse, now he is not with kareena kapoor so i wish that he will be on the top..hav u seen Jab We met movie. Farah Khan answers, yeah i saw jwm, i thought it was very nice. kareena was superb. zahid5 asked, Hi Farah Ji! Good Afternoon! What's ur opinoin abt some controversies with Om Shanti Om! I mean Manoj Kumar's episode and A scene before Dard-e-DIsco ! 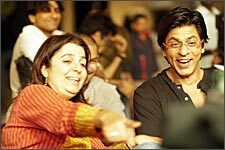 Farah Khan answers, It was not upsetting but I was quite surprised that he reacted so violently because a) it was all in good fun and humour and the whole movie was like that and b) I had already told him we were doing this two and a half months ago. but once we spoke to him and met him at his house, he was very nice and sweet. kabir asked, how u find out deepika for this role ....??? i wanna ask wer u hv seen her first ..
Farah Khan answers, I didn't find her, she found me. She came with her manager from this agency called Matrix, and they said she wanted to do a movie. At that time I was planning Happy New Year, which had 2-3 girls, so I thought maybe I'd take her as one of the girls. Then that didn't happen, and I tested her for OSO. Jiten asked, Hi Farah .. I Think u r the queen of masala entertainment .. I ve seen oso n lemme tell u i had a blast .. if SRK is King Khan then u r KQueen Khan ... God bless ur 3 children with good health .. Keep Rocking ..
Farah Khan answers, thank you! please make a crown for me and send it, na? :) I want to wear it all the time at home! hiddu asked, Farah what according to you is the key for success? Farah Khan answers, there is no key, otherwise everyone would be successful. I guess you just have to work really hard, and, of course, having some kind of talent always helps. plus being in the right place at the right time, I guess. Farah Khan answers, that's not a bad idea, actually. Was the film released over there? I thought only Rajnikanth was popular in Japan. Next movie, we'll definitely have a Japanese premiere . Shafee asked, FARAH WOULD U LIKE TO SHARE WHY NOT AAMIR IN OSO SONG??? I HEARD HE DECLINED YOUR OFFER? Farah Khan answers, Aamir had no time. He was busy editing Taare Zameen Par, and going for Ghajini's shooting. So he explained to me in great detail why it wasn't possible for him to come, though I would have loved to have him, salman and srk in the same shot -- for once at least. fanoffarah asked, farahji, u wud prefer baby boy or baby girls ? Farah Khan answers, both will be nice. imagine having three boys! At least one of each, for sure. krishna asked, hey farah! dis is krishna from essex,england. I would like to congratulate u for oso, also wanted to ask that today when people claiom bollywood has started going places and become more sleek , do u still belive that a good masala movie with srk is the best combination?? Farah Khan answers, well thanks for the congrats. is bollywood going dark and edgy? where? iitian asked, Do u feel inclined towards making socially relevant movies like Munnabhai which was also a masala movie of sorts...Now as you u have tasted success twice with pure masala flicks..
Farah Khan answers, if i get a script that makes a social point, yes. I think in Main Hoon Na we had an Ind-Pak peace tack going which is as socially relevant as I get. I'm not going to go out of the way to give a social message. If it's part of the script, exciting and fun, then I would do it. And isn't giving happiness to your audience socially relevant? fanoffarah asked, farahji, whose ur fav director in bollywood ? Farah Khan answers, well I may not have a favourite director but I have favourite films. I LOVED Rang De Basanti but hated Aks, so I can't say Rakeysh Mehra is a favourite. I love films like Koi Mil Gaya, Kuch Kuch Hota Hai, Chak De.. but there's not some director I want to be like. Internationally, Brian De Palma is my favourite. asr asked, Farah ji, OmShantiOm is good. But Shilpashetty's costume is not for family-watching. amir asked, If you were not a celeb, would you have been happy? Farah Khan answers, I don't think I'm a celebrity in any case. I don't behave like one and I don't take it seriously. Didn't you see me coming in the rickshaw at the end of the movie? iitian asked, Did u watch saawariya..please give an honest account ?? Farah Khan answers, no, i have not yet seen it. I'm not allowed to go to theatres anymore. I can't sit for 2-3 hours. Farah Khan answers, to begin with, I think shah rukh is a very serious actor. contrary to what it looks like, Main Hoon Na isn't hugely budgeted, it's an average budget film. why do I need to make a boring film to prove that I am a good filmmaker? Ashish asked, Hi Farah, Your movie "Om shanti om" is big hit. To whom will you give max credit and why? Rohit.H asked, Whose brainchild was it to make a movie which had so many funny spoofs?Were you afraid if it would be accepted? In Hollywood there are many spoof movies..but OSO might be the 1st one in Bollywood. soujanya asked, What is your inspritation for Debue director and making OSO?? Farah Khan answers, For all debut directors: All the best. Make your own kind of film, don't try to copy anyone else. That's the only way you'll stand out. If you're just making somebody else's film, why bother. kishore asked, Hello Farah...you have said many times that movies like Padosan and Half Ticket are your most favourites. On the other hand Shahrukh has expressed ( in many interviews ) that he wants to do a film on the life and times of KISHORE KUMAR. Did you both have any discussion ? any intention if there is a chance ? Farah Khan answers, Nope. I think a film on the life of Kishore Kumar may get very serious, because he was apparently serious and intense. Farah Khan answers, It is ALSO the key to his success. Somewhere, you have to be a great actor to survive 15 years. You have to be a good actor to do a Chak De and OSO in the same year. And often people think of a good actor as standing in a corner and being morose; just being flamboyant and energetic doesn't mean he's not a good actor. Farah Khan answers, Wow. I'll be busy with 3 babies the next year and then I'll try to make one movie a year, at least. Farah Khan answers, I had no fight whatsoever with him. Suddenly one day in print, I realise he's upset with me. I still don't have a fight with him. anita asked, Farahji you didn't answer to my question. I had asked why you didn't take Rajesh Khanna, Asha Parekh, Hema Malini, Sharmila Tagore and Mumtaj in the Deewangi song, after all they were the leading stars of the 70s. Farah Khan answers, We tried to get Hemaji and all, who were out of town. We would have loved to have many more stars, but if I tried to put everybody that I wanted in it, I would be still shooting that song! Farah Khan answers, I was hardly his best friend, I was pulling his hair out! Farah Khan answers, I think Deepika has the potential. Then there are Ranbir, Shahid, Neil..
Shafee asked, WHAT IS THE BEST AND WORST COMMENT THAT YOU HAD EVER GOT IN YOUR LIFE? Farah Khan answers, for OSO, i got a lot of good comments saying 'the most honest film' to 'my love for cinema shows in the film'.. but somebody I don't want to name, a very respected writer, texted us and said 'the good thing about the movie is that only we could have made a movie like this. it isn't aping european cinema or french cinema. It is pure Indian cinema and only we could have made it.' .. and the worst thing I feel is when people say 'leave your brains behind when you come to watch this movie.' that's really ridiculous. priya33 asked, whats happening with HAPPY NEW YEAR!? is it still on the cards? Farah Khan answers, I'm trying to figure it out. I just fished out half the script, and will decide if its still going to happen or not. Aniroodh asked, I jus luvd d song Dhoom-Tana.... how was it like shooting for this song.... nd d SFX was 2 gud.....any funny incidents while canning d song ? Farah Khan answers, it was really tough to shoot that song, because literally deepika had to dance with a pole in front of her -- there was no actor for her to communicate with. I wish the SFX were better but I think it was the first time this was being done anywhere in the world, so it took a lot of time and trial and error. samdas asked, WHY IS SRK not working FOR THE NEXT 9 moths??????????? I thot u are the one who is PREGNANT!! LOL anyway plz plz plz plz GIVE US some khufiya info about his next... is it with KARAN JOHAR nad KAJOL??????????????? Farah Khan answers, :) very funny. he isn't working because a couple of movies he was supposed to do didn't happen, and I'm sure something else will turn up. He's not the type to sit at home for nine months. saritapunjani asked, Hi, All the best for bundles of joy arriving very soon into lur ife!! !do u feel that humour & music is initial attraction for ur movies? wont u work as a chreographer again apart from SRK's production & ur own home productions? Farah Khan answers, well I won't be working as a choreographer again. As of now I don't plan to. And well, humour and music are a part of my personality, so I guess they'll show in my movies. kavya asked, hi Farah, i am kavya from Gurgaon. U didn't answer my question. Firstly, i love both ur movies OSO n Main Hoon Na. They were fabulous. But tell me, why did u cast a new actress in OSO for the role of Shanti Priya??? Farah Khan answers, yeah. I thought it was time for Shah Rukh to work with somebody new, and I needed an old-world, classical beauty. Afrax asked, Please make a movie with Salman Khan. Farah Khan answers, Okay, next time -- if there is anything for him. vcg45@rediffmail.com asked, hi farahji, How do direcotrs manage to make film with keeping just one hero in mind? Isn't it restricting ur idea, and make ur thought ( while story writing) to concentrate around persona of that particular actor? Farah Khan answers, yeah, I guess so. it could be. Farah Khan answers, most of them are good dancers. aishwarya, shilpa, rani, deepika. AVI asked, HI FARAH, I LIKED MHN MORE THEN OSO ,I THINK YOU LOST GRIP OF THE PLOT IN THE 2 ND HALF ,WHATS YOUR SAY,ALSO WHATS YOUR NEXT PROJECT ? Farah Khan answers, as long as you liked my movie better than mine, I'm happy. but when MHN released, everyone said the same thing about the second half. I guess I have problems with the second half. iitian asked, leave your brains behind when you come to watch this movie.' that's really ridiculous ??? well do u want us to believe in ghosts and all ?? Take those events like sharukh entering the burning set from nowhere after making a small dent in the window(which was still somewat intact after 30 years)... I know all this goes..but u have to keep brains aside to accept all this ...Dunno u think so ?? Farah Khan answers, that's a valid question. actually we had shot a whole sequence where he enters the set, finds a root, breaks a door -- but the movie was getting so long and we had to edit it. sometimes you have to take cinematic liberties, otherwise you would show a man walking home, take a bus, etc. What I meant to say was that it takes a lot of intelligence to write a film that works on so many levels. mukul asked, What are your favorite English movies? Farah Khan answers, lots! Singing In The Rain, Amadeus, The Shining, Clockwork Orange, City Slickers... Crash.. Baz Luhrmann's Romeo & Juliet..
Farah Khan answers, I'll just ask Manoj-ji to send me his next script, and I'll get to work on it as soon as possible! Farah Khan answers, asha bhosle, sunidhi chauhan..
Amal asked, Hi Farah, Will you make a detective movie siometime? Farah Khan answers, I have no idea. Why not? Always keep the options open. Farah Khan answers, he almost played 7 in OSO! I think this has already been done by sanjeev kumar and kamal haasan and all, and isn't something very new. Farah Khan answers, both V-S and me wanted a Kishore Kumar feel actually. he worked very hard and it took him actually three days to finish the song. And for him it was a very different kind of song, he normally sings those breezy romantic numbers. Balaji asked, Hi Farah, What the reason for sharukh to have his 6 pack? Farah Khan answers, wanted to torture and starve him for three months :) and then undress him and wet him. wasn't it worth it? Farah Khan answers, thanks, wow. sandip asked, Farahajee, is it bit difficult to direct when there is new actor/actress in the movie (like Deepika Padukone)? Farah Khan answers, It's not difficult but definitely you have to spend more time and energy on them, rather than somebody like SRK or Shreyas, where you can give them the scene and they can take it forward. You have to really work hard and tell the newcomers each and every nuance, but I think its good because it keeps the director on her toes. And expresses the hidden actor in the director too. 123sad asked, what if OM shanti OM was made by Mr.Bhansali and you directed Saawariya..........? Farah Khan answers, I've already gotten into trouble on Koffee With Karan for answering this question, I will not fall into the same trap again. raji asked, hi farah, saw OSO yesterday. congrats to the entire crew for making such an amazing movie. Even your 1st movie was awesome. Specially like to mention the importance you give to each and every crew member. I liked the ending when you show the spot boys coming in cars and the director in an auto...congrats once again!!! Farah Khan answers, Thanks. The spot boys had a great time getting suited and booted. they refused to serve tea to anybody that day. And I hadn't sat in an auto for very long, so I got to do that too! :) Thanks a lot, was great fun chatting with all of you. Now it's time for my lunch. Glad you enjoyed the film.